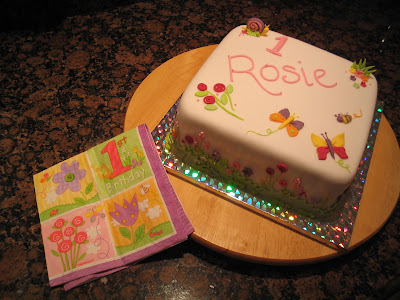 Rosie's 1st Birthday cake was made to match the napkins, plates, balloons and bunting design. 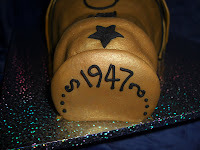 The sponge cake inside was even coloured pink! 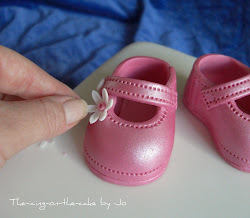 - very girly! 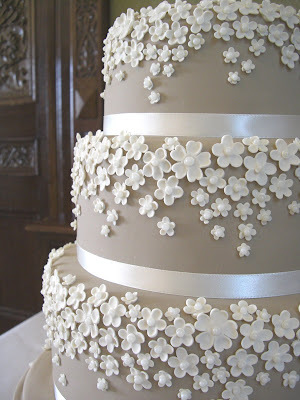 A 3 tier cappuccino coloured stacked cake dotted with ivory blossoms. 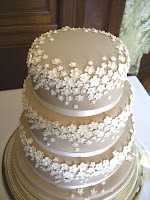 I have to say, when Sarah said she wanted a 'brown' wedding cake, I did have my reservations!. 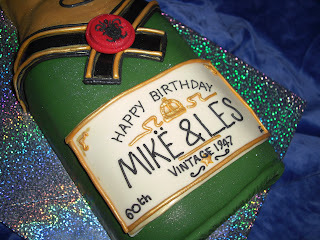 But now, I do love this cake! - it worked so well with the colour theme which ran from chocolate brown, through to shades of coffee & creams. 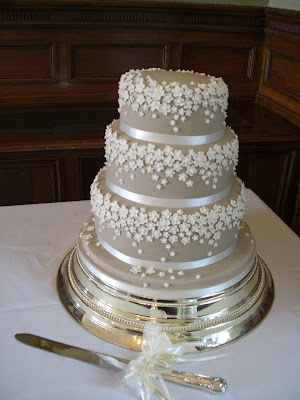 The bottom & middle tier were fruit cakes - and top tier vanilla sponge (there was also an additional tangy lemon sponge cake - decorated in the same colour theme, this went straight to the kitchen and was offered as a summery alternative to the traditional rich fruit cake). 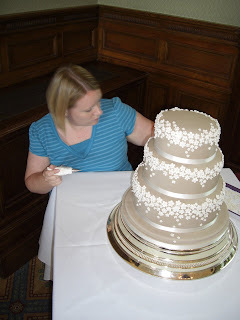 Each hand made blossom was dotted in the centre with an edible pearilised ball, and painstakingly applied by hand to the cake (Here's me adding the finishing touches!). The vast majority of the blossoms were attached prior to delivery at the wedding venue. 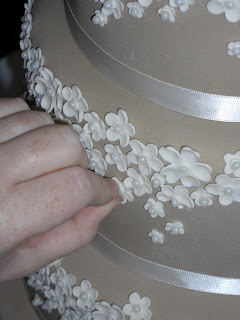 Any blossoms broken in transit were replaced and the final flourish of blossoms were added once the cakes were stacked. 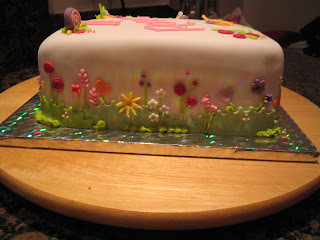 ...In the end I lost count of the number of blossoms on this cake! ...The cake got a thumbs up from the Bride! ...and quite a few compliments from the guests too! 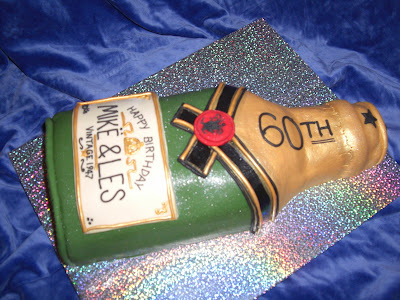 A Champagne bottle to celebrate Mike & Lesley's joint 60th Birthday! A tangy lemon sponge cake! (mmmmmmmm). A slight change to the usual MOET & CHANDON label!